Welcome to the League of Women Voters of Needham! The League is a dues-paying membership organization that encourages informed and active involvement in local, state, and national issues. The League supports issues, but never supports candidates for office or political parties. We are dedicated to Making Democracy Work. One of the most respected and effective grassroots organizations in the country. 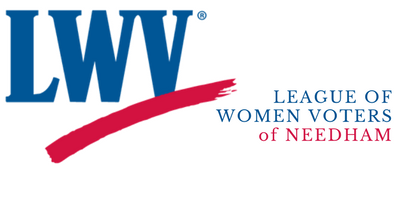 Join the League of Women Voters of Needham and become a member of LWV Massachusetts and LWV of the United States. Add your voice to a powerful force at all levels of government. Read about LWV-Needham’s accomplishments in 2017-2018. LWV-Needham and the LWV-Needham Education Fund are supported by donations from generous supporters. LWV-Needham is a 501(c)(4) nonprofit. Donations are not tax deductible. LWV-Needham Education Fund is a 501(c)(3) non-profit. Donations are tax deductible. A donation to either organization supports our mission locally, in Needham. See a list of the activities supported in 2017-2018.